Written by Richard Thomas, The Essiac Report revealed how a potential cancer cure was dismissed by government authorities. 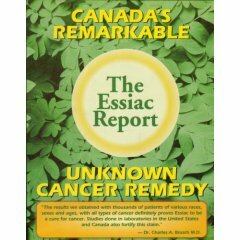 The results we obtained with thousands of patients of various races, sexes and ages, with all types of cancer definitely proves Essiac to be a cure for cancer. Studies done in four laboratories in the U.S. and one or more in Canada also fortify this claim. Good results obtained by taking the Essiac herbal medicine included cessation of pain, increased appetite, weight gain, feeling of well being which reflected improved emotional attitudes regarding depression, anxiety, and fear and prolongation of life. Results improved with the continuance of the Essiac medication. Each patient that they treated received a thorough physical examination, including blood analysis, EKG, x-rays, and any other clinical test that seemed pertinent. The range of types of cancer included colon cancer, cancer of the breast, uterus, lip, liver, prostate, lung, and basal cell carcinoma. You can find documentation of their studies in the book, The Essiac Report by Richard Thomas (The Alternative Treatment Information Network, 1994). However, their case studies are ignored and disputed by big gun cancer groups such as the American Cancer Association and the NIH, who did not have a hand in planning them from the start. They are considered “anecdotal” and dismissed as real science. Why is Essiac Tea dismissed? Couldn't they see that this is a tea with little or no side effects that offers great value for the money? According to the Essiac Report, the reason is a simple but a recurring one: the desire for power and control. In this book, you will read documentation that make obvious the power struggles and vested financial interests of government and companies between the 1920s and 1980. The very structure of these organizations and their methodology do not provide an outlet for herbal remedies that may benefit the public. Essiac Tea is a complementary remedy that can go hand in hand with conventional cancer treatment. If it was embraced more by the medical profession and these agencies, it is possible that fewer people would die from cancer. In all, more than 100 readers have rated this book 4 or 5 stars in Amazon.com, and none of them has anything bad to say about it. Highly recommended.